I really want to communicate to you the diversity of Japanese acupuncture treatment. Many patients are under the mistaken impression that acupuncture is only good for relieving pain, musculoskeletal problems and fertility treatments. I would just like to recount 5 short case histories to help broaden your understanding of the versatility of this amazing healing modality. Adam came clinic about three weeks ago, he was desperate to gain relief from his pain . Apart from having had lower back surgery, severe kidney difficulties, diabetes, a cancerous growth removed from his ear he was suffering from the most severe case of gout that I have seen in my 28 years of clinical practice. His right knee was the size of small soccer ball and about the same color as ripe raspberries, I could feel the heat from his knee a meter away from his body. I can only imagine his mental anguish, especially after having unsuccessfully undergone corticosteroid treatment and run out of options using the Western medical model. To cut a long story short, Adam is now relatively pain-free and I will be interviewing him very shortly regarding his opinion of the efficacy of Japanese acupuncture in assisting him to overcome this diabolical situation. Kenrick is an elite swimmer and has set himself for the 2012 Olympics. After assisting Kenrick to fully recover from a broken elbow, he competed in the Queensland state tiles and was very disappointed in his performance. He arrived in clinic absolutely exhausted and somewhat dejected about performance. I suggested he might like to try acupuncture performance enhancing treatment, he grabbed the opportunity with two hands. In his own words, in the week following, he trained the best he had in a couple of years and I believe he even swam a personal best for recent times. Amy had a regular Japanese acupuncture treatments during her pregnancy, whilst not claiming total responsibility for the incredibly rapid birth of her first child, I am convinced and I know Amy is convinced that acupuncture treatment was a key factor in her amazing story. “Look who arrived whilst you were holidaying in NZ! I just wanted to thank you and Andrew for the great acupuncture treatments throughout my pregnancy & prep for birth. I went into pre-labour Wed 8th Feb (irregular tightenings). We went into the birth centre for a check up on Thurs 9th & midwife said the cervix was very ripe- beginning to dilate & I’d probably have the baby in the following 24 hrs. On Friday 10th Feb, 11:30am everything kicked into gear! By 12:30 I asked Matt to call the midwife to let her know I was coming in to birth our baby. She said oh don’t rush in- come in a couple of hours. So I went and had a hot shower which seemed to slow everything down. I was having an almighty urge to go to the toilet, as I sat down, Matt said uhhhh stand back up, I can see something! It was bubs head starting to crown!! We got the midwife on the phone, & she called an ambulance. She also said to Matt he’d be delivering our baby- there was no time left! We put towels down in the bathroom, had the midwife on loud speaker, & next contraction his head was out. One more push, and out he came into Matt’s arms. The paramedics arrived & insisted on taking bub & I to the birth centre (I didn’t feel we needed to as everything was perfect). Little Max Leo weighed in at 7lb & was 51cm long. One of my local surfing buddies, Darryl was recently diagnosed with Bharma Forest fever courtesy of a mosquito plague at Rainbow Bay whilst I was away in New Zealand. He was one sick puppy, aching all over, swollen and painful joints, diabolical headaches and overwhelming lethargy, basically bed ridden. I heard of his plight through some mutual friends and contacted him and suggested he might benefit from some acupuncture treatment. Since the Western medical model had been unable to provide him with any relief whatsoever he agreed that this might be a good idea. I’m absolutely delighted to say that he is back surfing again, within a fortnight of commencing treatment. His body aches have resolved, his swollen and painful joints have eased significantly, only his chronic knee and lower back issues remain uncomfortable. He has suffered no headaches since commencing treatment and his overall energy has improved out of sight. Charles is the drummer from the band OKA. I was recently in New Zealand for a music festival that I attend annually and one of my favorite bands from Australia (OKA) were scheduled to play and were one of the highlight attractions of the Festival. Charles flew to the South Island New Zealand from Samoa via Auckland. He ate from one of the food outlets at the airport and that is when his nightmare began. He arrived at the Festival venue some four hours before the band were due to perform with a severe dose of food poisoning that had resulted in him suffering from extreme, explosive diarrhea and absolutely overwhelming lethargy. I heard of his plight and grabbed my needles and headed down to the tent in which he was laying, distraught and curled up in the fetal position under a sleeping bag. The possibility of him playing a one half hour super active set on the drums was next to none. He was barely able to straighten out in the prone position. One hour later after an extremely gentle acupuncture session he was strong enough to get out of bed and we assisted him to the car. Once again to cut a long story short, Charles and the band performed with distinction and were definitely one of the highlight performances of the festival. Here is an email I received from Charles this morning. Hope you’re well. Sorry i never got back to you earlier. Hit the ground running on return from Samoa. My recovery was swift and I was back to my best over a few days. I can’t thank you enough for the care and concern you showed. Looking forward to Catching up somewhere soon. I trust that my clinical recollections go some way towards expanding your awareness of the clinical efficacy of traditional Japanese acupuncture. Wishing you all the best and may the changes that occur during this year of the Dragon be of a positive and beneficial nature for you. Alan is an internationally recognized teacher and practitioner of Japanese Acupuncture. He has presented, convened and hosted more than 50 Japanese Acupuncture/Meridian Therapy workshops in Australia, New Zealand, USA and the Czech Republic. 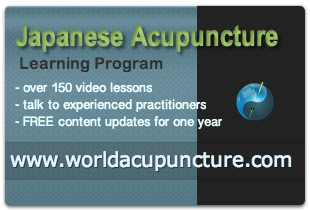 World Acupuncture Going Global with Japanese Acupuncture treatment. Thanks! This post helps me a lot of information about acupuncture calgary. I think those who may read this will enhance their knowledge regarding this matter.